Isla Mujeres of Mexico is one of the Quintana Roo’s best kept secrets. The amazing island, situated within the Caribbean Sea, is thought to be one of the destinations in the world that everyone should include on their travel bucket list. For anyone looking for a relaxing beach vacation, visitors will find plenty of lounge chairs, hammocks, and panoramic pools on the island. For people looking for more adventure or opportunities for entertainment, the island is one of the best places around. 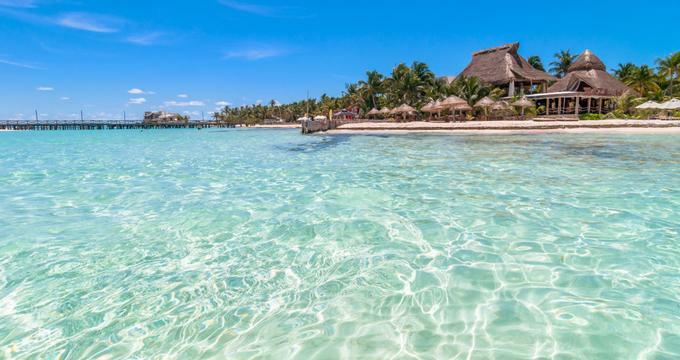 The breathtaking coral reefs and calm waters of the western part of Isla Mujeres are a great alternative for diving or snorkeling, even if visitors are beginners. The underwater sculptures located near the Manchones reef, the Isla Contoy National Park, and the El Farito reef are all sites that many people say aren’t to be missed during a trip to Isla Mujeres. Guests can also enjoy swimming with dolphins, swimming with gigantic whale sharks, biking, ziplining, and exploring the cliffs. The island offers a unique experience for anyone who visits it. It has been said that Isla Mujeres was originally discovered by the Mayans, pirates, and Spanish conquerors. This make the island an interesting place that is full of different stories. Visitors can stroll through the streets lines with local businesses, explore the Municipal Palace, watch as locals pass by running their daily errands, or enjoy a refreshing fruit drink and simply relax in the main square. A stroll along the pier provides the feeling of the cool breeze from the sea, and a chance to see the fishermen returning to land with their catch of the day. Visitors can take a tour via golf cart around Isla Mujeres, which is a popular way to see the island. Exploring the beautiful island offers the opportunity to see colorful murals called Sea Walls, or Paredes de los Océanosin, which are part of the island’s cultural project dedicated to ocean conservation. During a trip to Isla Mujeres, one dish to try is Tikinxic fish, which is the main dish of the island. The dish features a fresh fillet of fish in white wine and achiote sauce, and served with a red onion and pepper salad, and a side of rice. This typical dish of the island offers a memorable combination of flavors. In the island’s southern area is El Garrafon Park. This park, that is adorned with reefs, features amazing natural scenery and remarkable views of the Caribbean Sea and the captivating colors it displays. The view is particularly amazing from the Punta Sur Cliff, which is the highest elevation point on the entire Yucatan Peninsula. From the cliff, it’s possible to see the Sculpture Garden, the temple to Ixchel created by the Mayans, and the Lighthouse, as well as a great view of the stunning sunrise in the mornings. For relaxation, visitors can take a nap in one of the handmade hammocks or enjoy a refreshing tropical cocktail as they take in the view of the calm sea and reef. Guests can also take a refreshing dip in the pool, which measures thirty-five meters long and offers views of the sea and the coast of Cancun further in the distance.